In recent times, Germany's military has been making headlines with its equipment shortages and poor performance, however, next year, the country is going to take on the leading role in NATO's rapid deployment force "Speerspitze". The German Bundeswehr lacks tanks to fulfill its obligations to NATO as the ninth tank brigade stationed in Münster, which according to army's plan should be engaged in NATO's new force, now has only nine combat-capable of the required 44 Leopard-2 tanks and three of the 14 Marder infantry fighting vehicles, newspaper Die Welt reports, citing a secret document of the country's Defense Ministry. According to the media outlet, in early 2019 the Bundeswehr is due to assume a decisive role in creating the alliance's rapid deployment force unit "Speerspitze." T-Online says that this operational group is able to be deployed in crisis areas within a few days and is aimed at "deterrence of Russia, with the help of the German tanks as well." The reason for the shortage, according to Die Welt, is a lack of spare parts and high maintenance costs. The German army will try to cover the "existing deficit of capabilities with elements from other strategic units." The report emerged after on Tuesday, NATO Secretary General Jens Stoltenberg urged the new government in Germany to increase defense spendings in order to attain the alliance's 2 percent of the GDP goal. Expectations of the Bundeswehr's readiness to invest in NATO are growing, whereas numerous publications in the media mention Germany's defective tanks, helicopters and submarines. There were even reports that equipment shortages have forced the German military use broomsticks instead of machine guns during NATO exercises. In early 2018, media reported that Germany's new Puma infantry combat vehicles are already outdated, while funds for modernization are running low. In January, it was reported that Angela Merkel's government approved a record breaking €25 billion ($30.9 billion) worth of weapons sales since taking power in 2014, angering political rivals as well as the German public, according to the ARD public broadcaster. 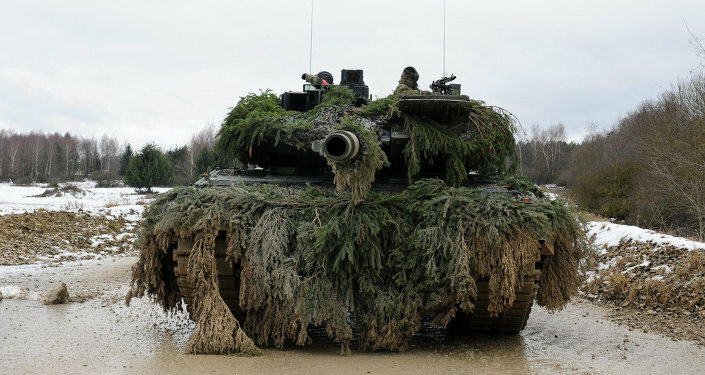 The Leopard 2 is the Bundeswehr's battle tank which was developed in the 1970s. In November, Focus magazine reported that whereas the Bundeswehr had 244 Leopard-2 tanks in service, only 95 of them are in full combat readiness. Meanwhile, 53 tanks were reportedly being upgraded, seven were at test sites, and multiple others could not be repaired due to the lack of spare parts.